The year that the term “flying saucer” was invented (perhaps due to a journalist's mistake) may not actually mark a First Contact situation for humans and aliens. The USA tends to use that as a benchmark for strictly americacentric reasons, since the UFO sightings in Washington state and New Mexico generated wide media attention here. It also coincides neatly with the development of the Nuclear Age, since the heat and radiation intensity of the atom bomb explosions two years earlier would plausibly have created unique features that may have drawn the attention of alien observers. From a worldwide point of view, UFO observations had been going on more or less regularly for some time in various parts of the Earth, all the way back to ancient Egypt. Nevertheless, 1947 does merit a place in history as the birthpoint of ufology and the beginning of a period of intense UFO reports that stretched into the 1960's. The tailing off of this phenomenon also coincides well with the dawn of the Space Age, as from the Sputnik launch onwards, humans became greatly enabled in their observations of our own upper atmosphere and the space immediately near it. One might surmise that, if anything, this heightened ability would have led exponentially to more UFO reports, but that does not seem to have been the case. With this in view, I would like to examine the speculative question of whether our planet may currently be subject to a cosmic quarantine that has resulted in a decrease of “flying saucer” type reports. This is a difficult area for many reasons. First of all, a great deal of information has been hushed up by military and intelligence sources. This is particularly true of World War II era incidents, when the development of secret weapons made this sort of obfuscation a matter of daily fact. The Cape Girardeau case and the various “foo fighter” claims during the war fall into this category, as does – after the fact – the Roswell incident which was tardily varnished with a story of high altitude observation balloons that was close enough to reality to fall into the parameters of deniability. As regards the stories of alien landings on the planet, especially two incidents in Sweden and Brazil, there are also serious scientific impediments to accepting them at face value. For alien creatures to willingly expose themselves to the Earth's atmosphere and the soup of potentially harmful organisms and substances contained therein would seem to be a contradiction to common sense, even if an alien civilization had done a fairly thorough biological scan of our planet. After all, new species are still being discovered in parts of the Earth and new microbes are evolving rapidly right now. The Earth is literally bursting with life, so that any survey would become obsolete in a short time. Thus, even within the bounds of speculation, it is most reasonable to assume that alien observation would most likely take the form of robotic devices rather than appearances in the flesh. One possible exception to this caveat about physical encounters is the famous Hill Incident in New Hampshire, in which the aliens are reported to have established a type of telepathic communication and perhaps control over the human subjects and are not described as exiting from their vessel. There are too few descriptions to hypothesize about whether humans might have been able to be examined in sterile conditions by alien visitors, yet the details of the Hills' experiences do not preclude such a scenario. The vast mass of alien abduction stories that have proliferated since the Hill Incident tend to swamp the original case in a mass of essentially unrelated material. Examined on its own rights as a single chain of described evens, though, the Hills' encounter will probably continue to stand as a keystone reference for speculative thought until further information is available. I would propose that one regard it as a climax event, rather than a springboard, for speculative ufology. Supposing that if there is any truth value at all to UFO reports from 1947 on, and that it may indeed have been nuclear fission that attracted observation of Earth from outside near space, there are several possible explanations for why conditions of observation may have changed since the early 60's, leading to the existence of a cosmic quarantine on the planet, and perhaps much of the solar system. The primary one has to do with what in the StarTrek lore is referred to as the Prime Directive. What Roddenberry's Star Fleet imputes to moral imperatives could even more convincingly be associated with sheer scientific procedure. As our own species delves deeper and deeper into the study of animal behavior, we find it more and more necessary to establish some separation from the species we are observing. Thanks to remote devices that do not attract the attention or fear of study subjects, we can peer into the nests of tree ducks, the burrows of meerkats, or the habits of deep-sea fish without causing that behavior to be altered or to disappear because of our immediate physical presence. Assuming humans are a species that requires observation – admittedly something we ourselves have been too reluctant to accept, it logically follows that separation is a highly desirable protocol of understanding. Of course, a behavioral Heisenberg principle also applies. Given our natural curiosity as an organism, if we were to detect the presence of another intelligence, we would very likely change our actions so much that it would destroy the reliability of previous data. In other words, now that we are able to observe not only near space with far greater accuracy, but even deep space through orbiting telescopes, we become increasingly likely to discover something that would profoundly alter the very notion of ourselves, so that we might not only change our value as subjects for observation, but even dangerously affect our ability to go on surviving. And there may not be a benevolent group of aliens willing and able, as in Arthur C. Clarke's Childhood's End, to coddle us and usher us into a new cosmic age. So without an immediate need to exploit Earth or humans for some reason, an external intelligence might well want to limit intrusion into what is going on inside our atmospheric blanket right now. Added to the inducements for distance is the possibility that we might be more unique than we give ourselves credit for. An intelligence capable of traveling in interplanetary space would – it seems more and more likely, as we discover a plethora of exoplanets – presumably discover many inhabited worlds, but others may not offer the richness of species diversification or the isolation of this little rock. Our “primitiveness” related to a space-faring intelligence may actually bode us well. A few final speculations as to how a cosmic quarantine may work. First of all there would have to be some kind of a space-based “Do Not Feed the Bears” sign. This could easily be achieved by a couple of stable units, probably placed at a good distance and perpendicular to the ecliptic of the solar system and protected from our view by stealth technologies, that would detect approaching craft and warn them off. The same units could contain sensors to observe Earth, as well as remote drones that could operate in closer proximity to the subjects. They might also be able to shield Earth from interstellar communication by generating an interference field that would cover the band of whatever it is an interstellar intelligence would use to communicate with. We already do this with our own military aircraft to jam certain bands used to target missiles, for instance. This is a sensitive area, since our technology is rapidly developing and we become more susceptible to “tripping over” a communications form currently unknown or undetectable to us. Of course, provided we don't destroy ourselves in the near future, we are likely to become too smart eventually for any quarantine to work. How an alien intelligence might deal with that puzzler extends beyond the scope of this essay. More speculation will be needed. 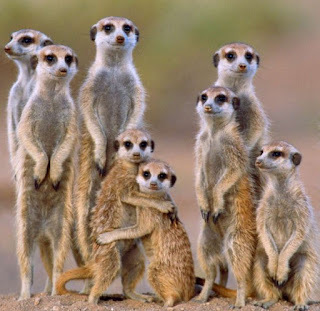 So with Forlani able to produce multiple offspring at birth -- up to six, but in Entara's case, usually more like three -- families can be quite large, as in meerkat colonies. 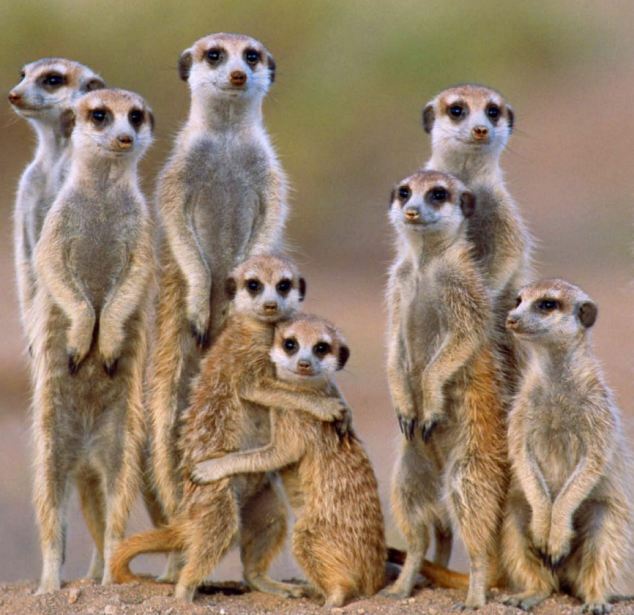 This creates the need for communal childcare, which among meerkats includes male members of the group assuming various child-rearing functions. The Forlani are similar in most aspects, with the institution of the mahame, or matrilineal headquarters, acting as a formal organization that provides educational, medical, and everyday support for female offspring beyond the immediate parental sphere. Note, we say female, because Forlani males have an entirely separate structure that we will explain further in another post. Suffice it to say that female Forlani identify strongly with the mahame and its values, just as meerkats do with their colony group. There are, of course, some differences between meerkats and Forlani females. Meerkats are full-fledged mammals, but Forlani are proto-marsupials, and there are thus considerable differences in physiology, such as the Forlani's elongate brain and double heart system. Unlike meerkats, who mainly eat arthropods, Forlani are primarily fruit-eaters, although they also enjoy certain kinds of grilled insects. Entara herself is a bit of an exception, since her time with Klein allowed her to develop some exotic tastes, such as a yen for crunchy toast. Forlani, like meerkats, have tails, but they are longer and almost completely prehensile, which harks back to the species' semi-arboreal origins in the primeval forests that covered Forlan before the Times of Trouble. The earthling Klein never realizes this until Entara takes him for a romp in the orchards on her home world and starts leaping into trees. This origin gives Forlani some distinctive customs that vary with those that a burrowing race like the meerkats would naturally develop. Finally, of course, the Forlani are highly adapted to tool manipulation and the development of technology, which meerkats have so far not been evolutionarily selected to exhibit. 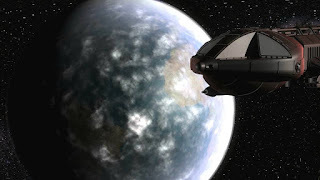 The Forlani abilities for technology were so great that at an earlier point in their history they developed an industrial civilization that nearly destroyed the planet, until a profound reorganization set up the matriline system and restrained tech development so that they never ventured into space. This only changed because of external forces, such as the Zetans and humans who wanted to exploit their world. To resist, the Forlani readily accepted an alliance with the warlike and spacefaring Song Pai, who favored the Forlani because of their strong veneration for the sacredness of procreation. So there you have a thumbnail sketch of the similarities and differences between Forlani and meerkats, at least as far as the females are concerned. Since the Forlani are quite sexually dimorphic, the males are another story, and we will take that up at length and talk about the Brotherhood at a future time. For now, happy reading!